Why am I blogging when I could be fishing? Actually, it is pouring down rain outside, so that is why I am sitting here in the cafeteria at the Gulf Coast Research Lab (GCRL) in Ocean Springs, Mississippi. A young girl in a sweatshirt just came in cursing because the room is cold. 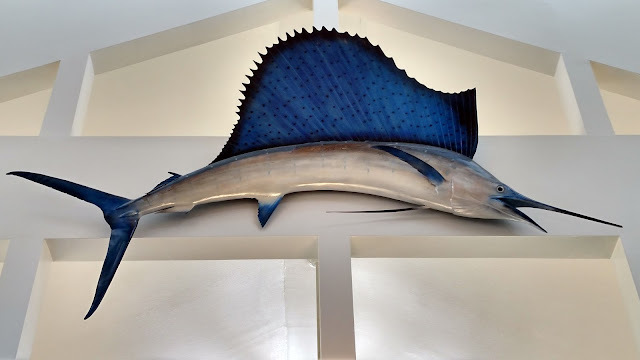 There are several large fishes hanging in the cafeteria at the Gulf Coast Research Lab in Ocean Springs, MS.
Every summer, I travel with a group of college students here. I have never been to a facility like this anywhere else. It is literally a college campus on the ocean. They have dorms, and "cottages" (think FEMA trailers), and a small house for students and faculty to rent. 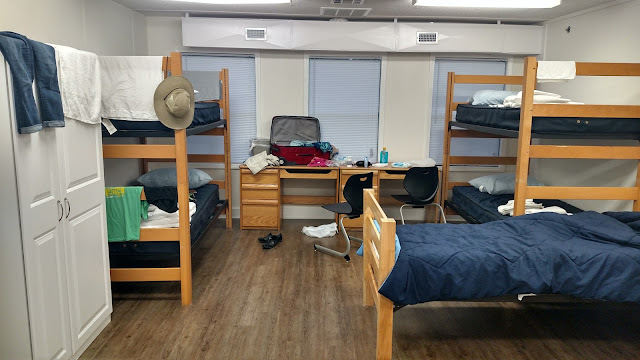 This was my room for the week. Aside from the cafeteria, they also have a library, and a museum full of strange saltwater creatures in jars and barrels. (The barrels are not see-through. Personally, I find this terrifying.) 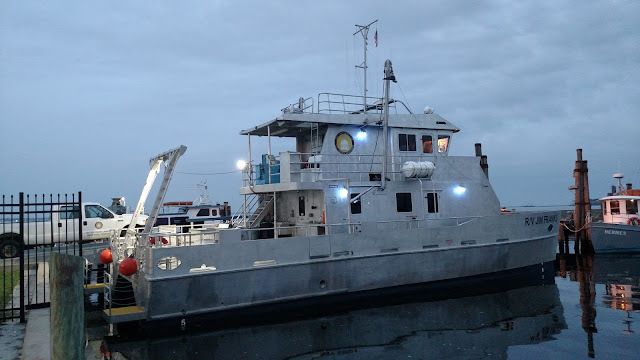 There are permanent-looking brick building labs for scientists and graduate students to do research, and several research vessels (boats) for field studies out in the Gulf. The tiger prawn shown here is an invasive species in the Gulf, and just one of the many creatures preserved at the GCRL's museum. 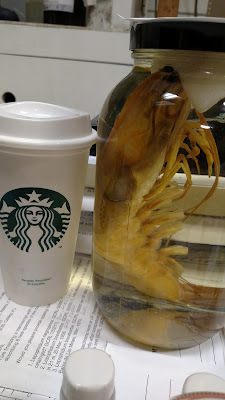 Note the Starbucks cup for a size comparison. 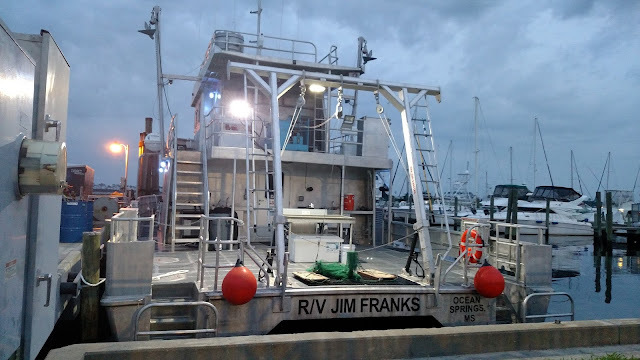 The R/V Jim Franks, the newest boat at the Gulf Coast Research Lab. Mr. Jim Franks is a researcher and the "most celebrated fisherman" at the GCRL. 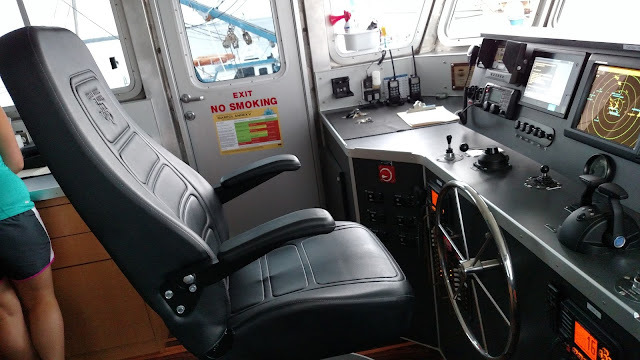 The captain's chair on the Jim Franks; the top level. Inside the Jim Franks; the bottom level. The rear of the Jim Franks. The green net in the center is the trawling net for collecting fish and ocean creatures. I was not able to go out on the Jim Franks, but I was happy to get on board and take pictures while it was docked at Point Cadet in Biloxi. The boat cost more than 2 million dollars, and the man it was named for was very humbled by the honor. I found Mr. Franks on campus and asked him about his boat. "It looks like a little battleship," he told me. There are 8 beds on board, and it would be suitable for a 48-hour trip. There are two bathrooms, but no showers. Researchers from the GCRL had already taken the boat out to Horn Island that week. Our students, most of whom were majoring in fish and wildlife biology, became very adept at catching crabs and fish near the campus. 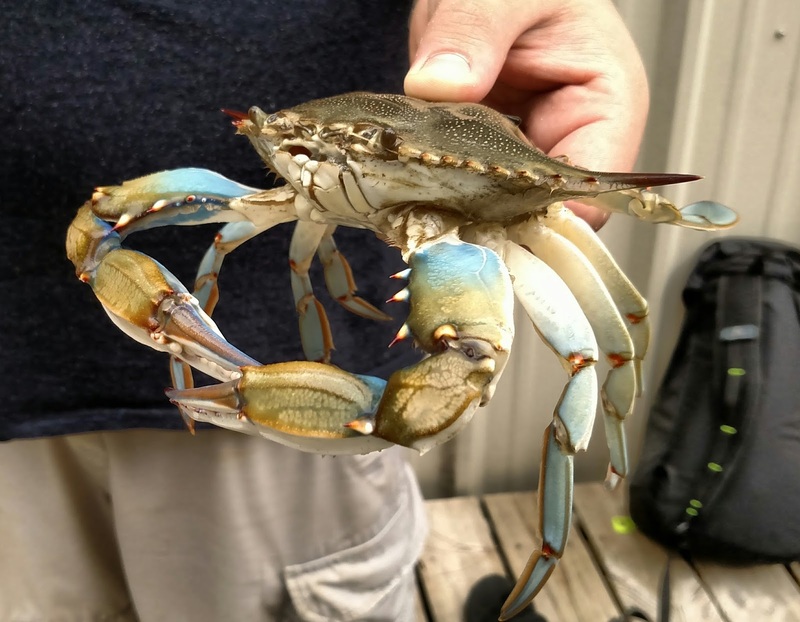 The blue crab, Callinectes sapidus, is beautiful AND tasty! I always tell our students to NOT stick their thumbs in the mouths of saltwater fish. 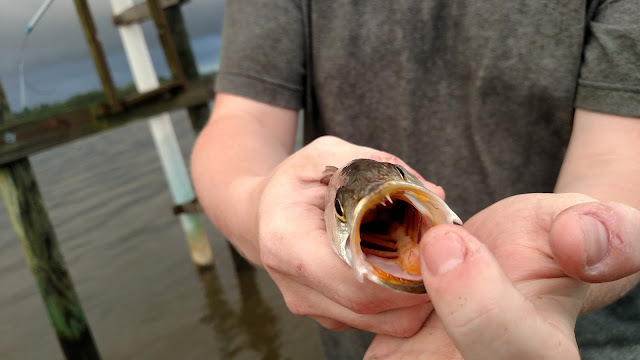 Look at the vampire teeth on this sand sea trout (Cynoscion arenarius)! 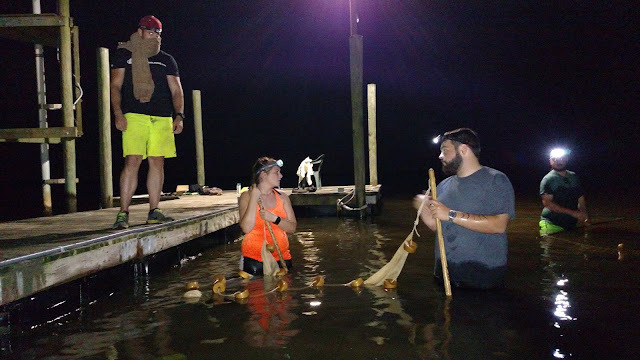 One of the most dreaded activities we do is the 24-hour diel study, where every 5 hours we take seine nets and kicknets and comb the water for any sort of creatures that we can catch. Since this is an ecology class, the students must identify everything from the nets. Over the years, I have seen several sharks (albeit small ones) caught from the main pier we use for our collections. NO ONE wants to get in that murky water at night, but we do it at 11:00 pm and at 4:00 in the morning. We were scared. We started singing the popular "Hell 2 Da Naw Naw" song as we waded through the dark water with our nets. Didn't anyone see Jaws? Late night ocean creature collecting is a character-building experience. 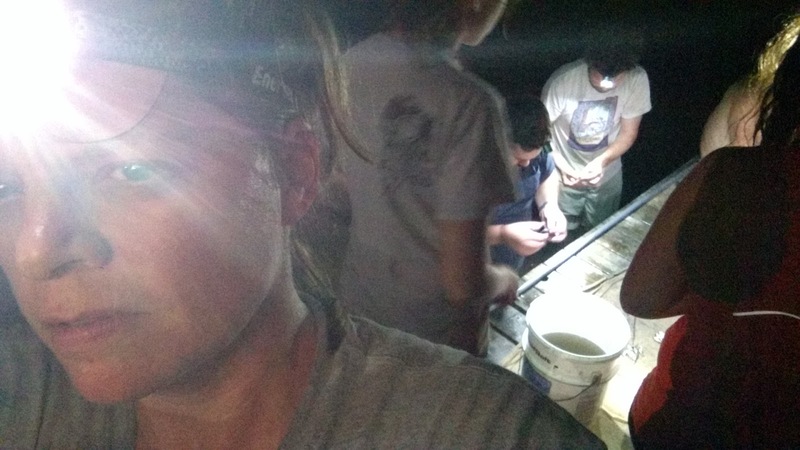 Here we are on the pier, trying to identify small fish and shrimp we caught in the seine nets. I absolutely love this class. I think it is the best undergraduate class a biology student can take. Learning how to effectively sample the ocean and how to identify all the different life forms you see inherently makes you appreciate the diversity of life and the delicate balance we have with them.